An 18-month-old male child was referred to our institute with complaints of fast breathing and repeated episodes of lower respiratory tract infections requiring hospitalizations in the past. On examination, he was underweight with no evidence of cyanosis or clubbing. There was a pansystolic murmur of grade III/VI along the lower left sternal border. The arterial oxygen saturation was 99%. His chest X-ray showed levocardia, cardiothoracic ratio of 0.6 with a left ventricular type apex and plethoric pulmonary vasculature. The echocardiogram was suggestive of levocardia, situs solitus, and congenitally corrected transposition of the great arteries (CCTGA) with SLL loop. There was large subpulmonic ventricular septal defect with inlet extension and left to right shunting. There is no left ventricular outflow tract obstruction [Figure 1]a. 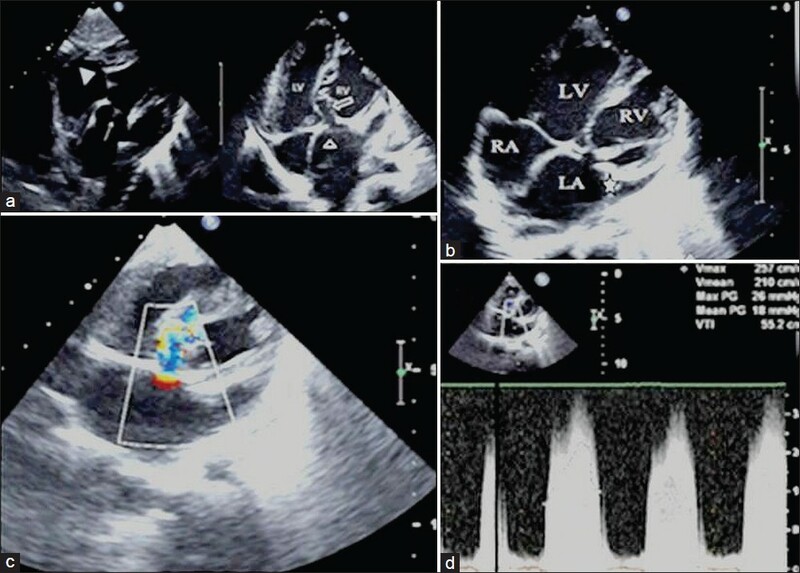 In addition, an echogenic membrane was noted just above the left-sided atrioventricular valve (morphological tricuspid valve) and below the left atrial appendage in the modified apical four-chamber view. The valve and subvalvular apparatus were structurally normal with a valvular annulus of 15 mm (Z value = −1.12). The membrane was causing severe obstruction of right ventricular inflow with pressure gradients of 26/18 mm of Hg [Figure 1]b and c. Surgical correction with resection of membrane and closure of ventricular septal defect was advised but declined by the family. CCTGA accounts for less than 1% of the cases of congenital heart diseases. CCTGA is known to be associated with ventricular septal defect, atrial septal defect, and obstruction in right ventricular outflow tract, tricuspid valve anomalies, and coarctation of the aorta. Abnormalities of the morphological tricuspid valve (left atrioventricular valve in SLL loop) are frequently found during autopsy in CCTGA,  These abnormalities commonly resemble the Ebstein anomaly of a right-sided tricuspid valve in hearts without ventricular inversion. Occurrence of obstructive lesions of right ventricular inflow is rare. A review of the literature revealed only a few individual case reports and a single autopsy series. Allwork et al.,  in their autopsy study of 32 cases of CCTGA, noted abnormalities of the morphological tricuspid valve in 91% of the cases; most of them were Ebstein malformations and only five had supravalvular stenosing ring. Marino et al.,  in their echocardiographic study of 42 cases of CCTGA, found only two cases with obstruction in right ventricular inflow. Both the cases also had subpulmonary obstruction. Supratricuspid membrane often originates from the left atrial wall below the left auricle, rarely from the tricuspid annulus. The pathophsyiological consequences of such a membrane are similar to the supramitral ring in hearts with concordant atrioventricular and ventriculoarterial connections. Both supratricuspid and supramitral are believed to develop after incomplete division of endocardial cushion tissue. Toscano et al., classified the supramitral ring into two categories based on the involvement of the valve: Supramitral type and intramitral type. In the intramitral type, the membrane is attached to the mitral valve and is associated with the involvement of the subvalvular apparatus. The distinction between the two types is important, as the surgical approach and outcome differ. Collison et al., in their surgical case series did not report recurrence of the supramitral ring after a mean follow-up of 30 months. However, Toscano et al., reported the need for reoperation in four of eight patients with intramitral-type membrane over a mean follow-up of 21.5 months. In the present case, the membrane falls in the true supravalvular category. In addition to other associated lesions, it is important to recognize this particular abnormality, as uncorrected obstruction in the inflow can lead to pulmonary venous hypertension  and may necessitate an alteration in the surgical plan. Echocardiography is an excellent noninvasive tool for diagnosis of this rare entity and obviates the need for catheterization. 1. Marino B, Sanders SP, Parness IA, Colan SD. Obstruction of right ventricular inﬂow and outﬂow in corrected transposition of the great arteries (SLL): Two-dimensional echocardiographic diagnosis. J Am Coll Cardiol 1986;8:407-11. 2. Allwork SP, Bentall HH, Becker AE, Cameron H, Gerlis LM, Wilkinson JL, et al. Congenitally corrected transposition of the great arteries: Morphologic study of 32 cases. Am J Cardiol 1976;38:910-23. 3. Choi ES, Kim WH, Park SJ, Min BJ. Right ventricular inflow obstruction caused by supratricuspid ring after the conventional biventricular repair of congenitally corrected transposition of great arteries. Korean J Thorac Cardiovasc Surg 2011;44:58-60. 4. Toscano A, Pasquini L, Iacobelli R, Di Donato RM, Raimondi F, Carotti A, et al. Congenital supravalvar mitral ring: An underestimated anomaly. J Thorac Cardiovasc Surg 2009;137:538-42. 5. Collison SP, Kaushal SK, Dagar KS, Iyer PU, Girotra S, Radhakrishnan S, et al. Supramitral ring: Good prognosis in a subset of patients with congenital mitral stenosis. Ann Thorac Surg 2006;81:997-1001. 6. Gupta V, Kothari SS, Sharma R, Bhan A. Systemic inflow obstruction in congenitally corrected transposition of great arteries. Indian Heart J 1997;49:81-2.